Last weekend was my first practical for the dog training course. Our theory classes take place in the classroom, but practicals take place at a large private boarding kennel, where we can use some of the boarding dogs in class. We began with all the usual things -- safety checks, a tour of the grounds, and some chat about our assignments. Then we started our first lesson with the actual dogs. In future some students will bring their own dogs, but today everyone was free to pick a kennel dog. The kennel owner explained to us that those who have quiet, well-trained dogs can usually convince a neighbour or friend to watch them when they are away. So the ones who are put in a boarding kennel are... less easy. Makes sense, I thought. I was keen to see what we could do, but also a bit nervous walking into the kennel area to a cacophony of barking. I looked down the line, evaluating my options. 2 German shepherds -- oh no, they have the 'not for use' sign. A little fluffer -- well, I'd rather something different from my usual, but then, it's less intimidating than the bigger ones -- oh, my classmate's already approaching that one, never mind. A beagle and a lab were pawing hopefully at the kennel doors near the end of the line. I've worked with labs before, the beagle's pretty cute and they love food, right? - let's go with that. If any beagle people are reading this, I'm guessing you're laughing already. For those who are still picturing Snoopy sitting on his doghouse stoically writing novels, I'll continue the story. Collaring and leashing up the excitable beagle was managable, and passed my instructor's assessment. We were to walk the dogs out to the field and wait with them out of reach of each other. Fair enough. But the minute I left the kennel, my new friend almost yanked my arm out of its socket to get over to another dog, a staffy. Uh-oh. I desperately yelled for my classmate to retreat as I was dragged over. I finally made it to the field after a firm talk from my instructor reminding me that as a grown adult I can keep the beagle under control and advising me on the safest way to hold a leash. 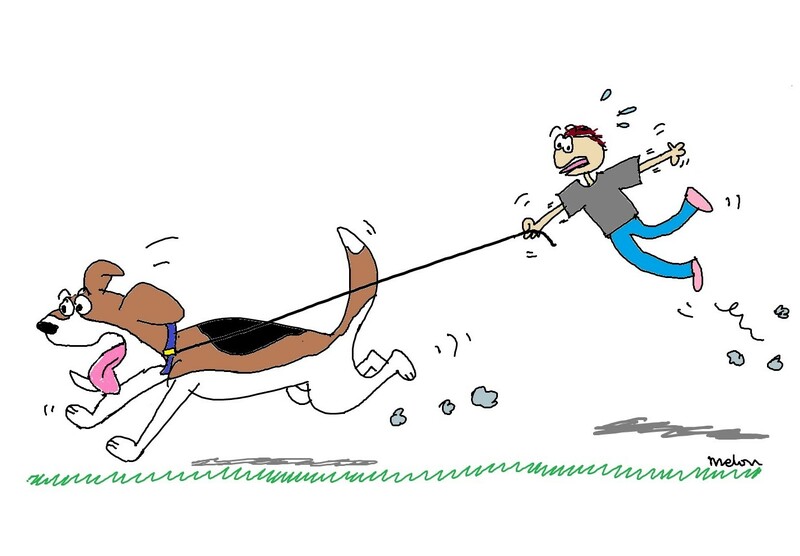 (That said, he also told me what to do if I was pulled over...) I grasped the leash as firmly as I could, my hands already smarting from multiple rope burns, and tried to stay upright as my beagle dragged me onto the field. I was the last to arrive, and everyone was standing around waiting for instructions, patting their dogs, one or two even giving their new friends belly rubs. After I completely missed all the instructions and my classmates stoically tried to ignore the ruckus, I finally managed to plant my feet to stop him from dragging us over to the other dogs. Of course, my new friend had to express his disatisfaction with this situation. Loudly. If you're ever worried you're not yet the centre of attention, try restraining a baying hound. Our first lesson topic was, surprise surprise, loose-leash walking. Before today I thought I had a pretty good idea of how to teach LLW, but I couldn't even stay in one spot without being dragged around by this beagle, much less teach him not to. We ended up taking breaks for de-briefing a couple of times -- "Same dogs after lunch, folks" -- so by the end of the day I had gone in and collected this beagle 3 times, each time feeling more tired than the last but determined to salvage what I had of my pride by at least not giving up. By the end of the day I had learnt three things: two different approaches to training loose leash walking, and not to take on a hound without a lot more practice. What a day! Well done for persevering with the beagle, I think I would have slunk back, tail between my legs well before lunch! Haha thanks Chris! Slinking is hard when you're practically airborne! This is brilliant! Good job for not giving up, and at least you started with the most difficult one so next time should be easier, right? Beagles are indeed very persistent and very strong, and they LOVE to dig - the people renting the house next to ours in Glenhaven had one for a while who would come over to our garden every single day while its owners were at work, no matter how well we nailed the fence back together and how many rocks we put to try to stop him tunneling under! He was so cute but I can't even imagine having to train that sort of dog, so well done! Ah I'm glad someone understands my pain, haha! 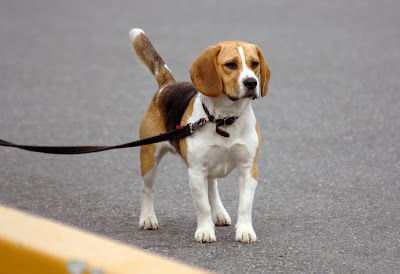 Beagles are pretty darn cute, which doesn't help convince anyone of my unfortunate plight - that 'little dog' packs a punch! But after reading your story, I see now - it's all in the persistence!